Nine people were arrested on their way to a funeral in Yalengga village, allegedly because they intended to fly the Morning Star flag there. Wiki Meaga was arrested on 20 November 2010 on his way to the funeral of a relative in Piramid village near Bokondini in the Central Highlands of West Papua. The relative had fallen ill after being tortured by police a few months earlier and had subsequently died. According to local newspaper Tabloid Jubi, a group of nine men, including Mr Meaga, were arrested on their way to the funeral, because they had allegedly raised the Morning Star flag in Yalengga village before they left. According to a court document (see below), Mr Meaga was arrested along with Toebaga Kilunga, Meki Tabuni, Wombi Tabuni, Obeth Kosay, Pastor Ali Jikwa, Oskar Hilago, Meki Elosak and Peres Tabuni. Only information relating to the cases of the first six of these men has been made available so far. The trial records of the other three men (whose names are given here as Oskar Hilago, Meki Elosak and Peres Tabuni) have not been made available. 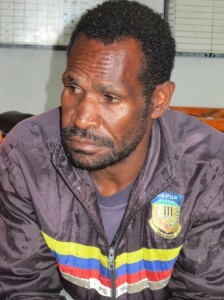 A report in the Cenderawasih Pos claimed that Pastor Ali Yikwa and Toebaga Kilungga were among 42 prisoners who reportedly escaped Wamena Prison in a mass breakout on 4 June 2012. By February 2013, information from Papuan lawyers in contact with Wamena prison authorities confirmed that Peres Tabuni, Meki Tabuni and Wombi Tabuni were no longer in prison. Whether they were released or escaped in June 2012 is unknown. In July 2014, lawyers from the Democracy Alliance for Papua (Aliansi Demokrasi untuk Papua, ALDP) reported that the clemencies for Wiki Meaga and Meki Elosak were being considered at the Indonesian State Secretariat (Sekretariat Negara Republik Indonesia, Setneg).